We’ve been blogging about floor displays mostly because they continue to be one of the most popular and effective ways of merchandising products off-shelf, or outside of the traditional, confining in-line environment. We kicked it off with Part I of this series in which we shared our first 10 examples of floor displays. Today, we’ll share 10 more examples. Let’s get started. 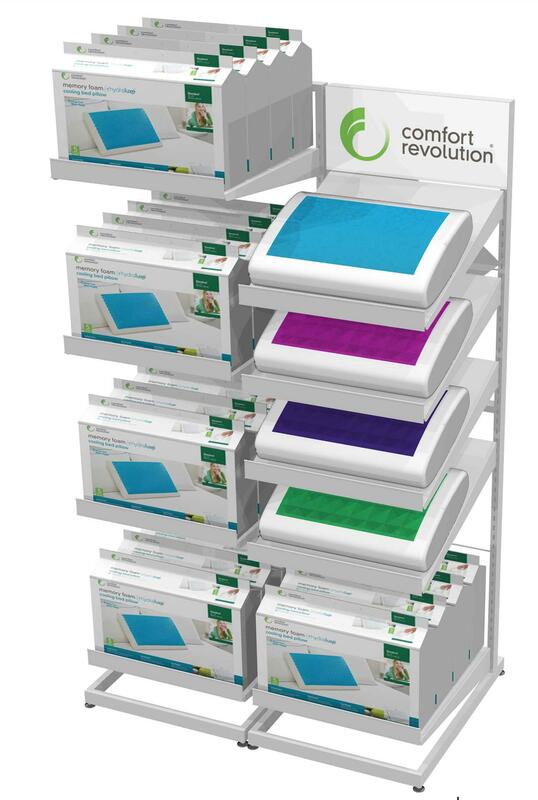 Our first example is a 2-part companion floor display we designed to merchandise Comfort Revolution’s line of memory foam Hydraluxe Cooling Pillows. Since products inevitably sell better when shoppers can touch and feel them (particularly true with products like a pillow), we started with a slanted shelf glorifier display which you can see on the right below. We kept it simple with just a white powder coated tube frame, slanted sheet metal shelves to display the pillows out of the box, a single shelf for boxed product, and a header sign. The approach with this glorifier was basically to let the product (and its eye-catching colors) do the talking. The glorifier display could be used as a standalone display for small format stores. Alternatively, it could be used in conjunction with the display shown on the left which was designed just to hold boxed product. There’s nothing fancy about our second floor display shown below, but we wanted to show it for its utility rather than its design. In creating this display, we wanted to show how a basic grid display could be dressed up a bit with the addition of an MDF base and side panels. It gives it a bit more of a higher end look than it would have with just a metal tube base and frame. This 2-sided floor display is very flexible and fairly high capacity. When it is merchandised with product, the grid disappears, and it becomes a very affordable mid-range mobile merchandiser. Third, we designed the wood floor display below for Andes Gifts. 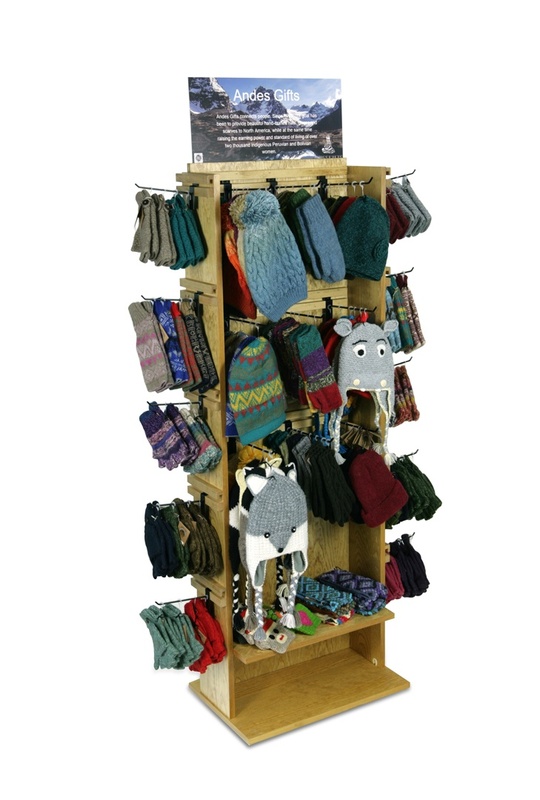 Our goal was to create a rugged, natural display which would fit the Andes Gifts product line- hats, gloves, and scarves hand-crafted by the indigenous women who reside in the highlands of Peru and Bolivia. We made the display in our millwork shop using pine plywood with a golden oak stain. We added single peg hooks, 1 shelf and a digitally printed PVC header sign. Below you can see the display with and without product. Our fourth example illustrates what can be done with a relatively low budget. As you can imagine, if you have a product like a breakfast cookie and even if you have a high number of product turns, the economics can’t support a high-end POP display. At the same time, you don’t want your product to look cheap, and you want your display to help create as much perceived value as possible. As you can see below, our approach was to use the cheapest structure possible- a fold-out wire floor display with removable shelves. We then dressed it up with PVC side, base and header signs not only to hide the wire, but to promote the Erin Baker’s brand. Our fifth example is based on a similar design philosophy in that we used a basic metal tube frame on castors with a grid center panel. This is actually one of our stock floor displays- the UMF-24G. To dress it up and make the unit look more upscale, our customer invested in die-cut PVC side signs and a curved 2-sided header sign. Sixth, we designed the glorifier floor display shown below for Duality Lighting. The simple purpose of this display was to create a side-by-side comparison between our customer’s LED lights and the LED lights of a competitive product. We used MDF with a white melamine finish and vinyl side graphics. The header invited the shopper to check out the difference in the lights which we installed in the top part of the display. As they say, seeing is believing, and this display was intended to do just that. We are big fans of multi-product merchandising and cross merchandising. 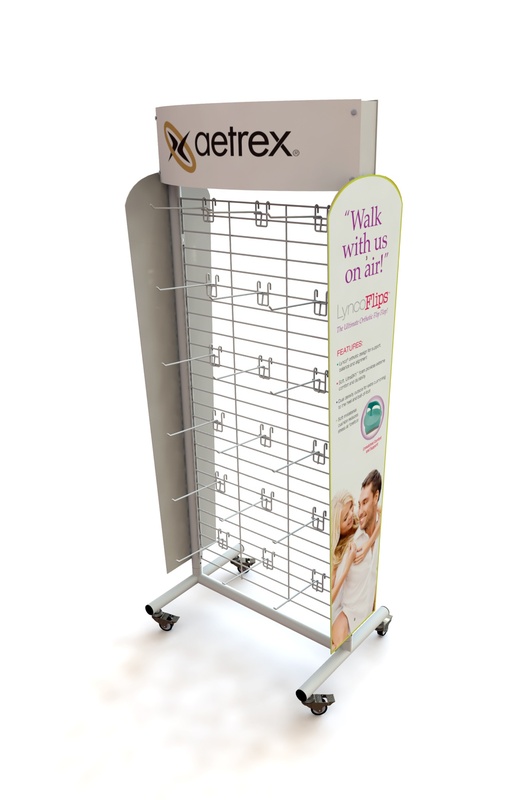 Our seventh example shows one of our stock units (MPM-XP) which was designed to be a flexible spinning floor display that can be used with a variety of accessories. It features a spinning MDF base and top with a connecting metal frame. 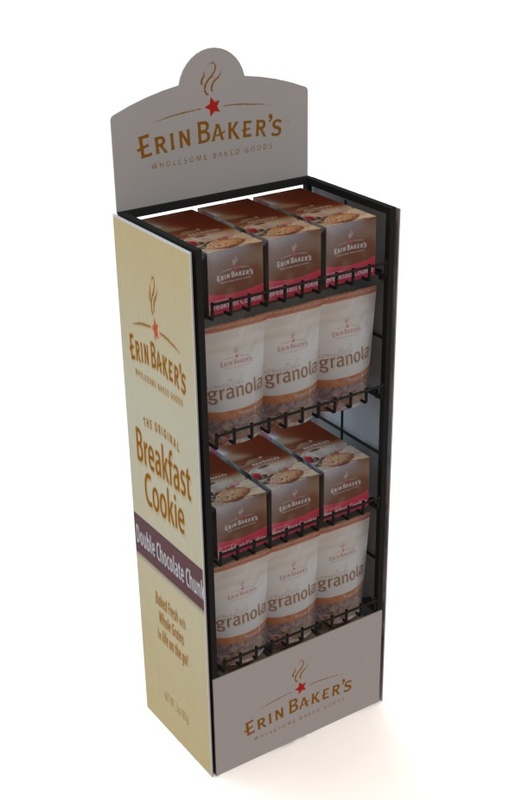 This display has a small footprint and works great in convenience stores, travel centers, and a wide range of retail environments. We’re showing it below with removable sunglass grids on the upper panels, and wire grids with cap pockets on the lower grids. The grids can also accommodate hooks which can be used to merchandise cell phone accessories, gift items, and many other types of novelty or impulse items. 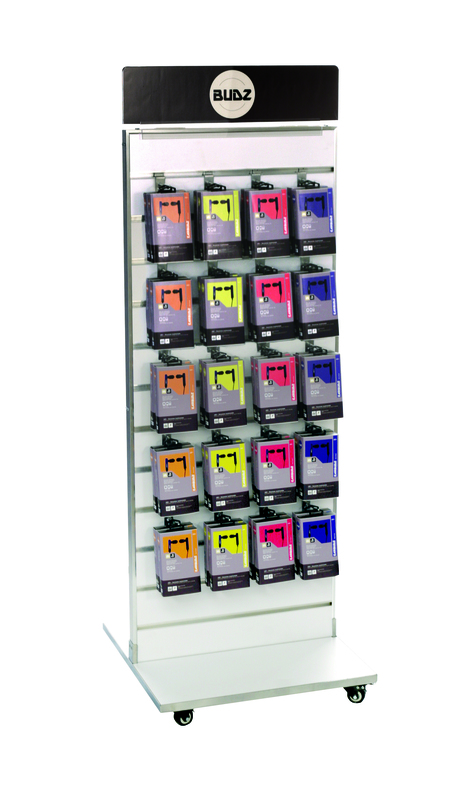 Our eighth example is a down-and-dirty, super economical floor shelf display called the DLXS-16SH, another merchandiser from our line of stock displays. 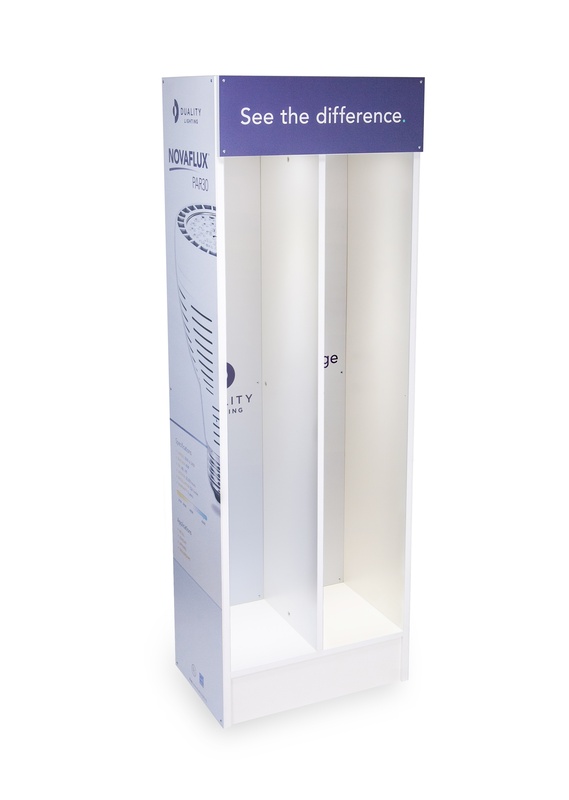 We’re showing this display as an example of the cheapest way to construct a floor shelf display. The display features a basic tube frame with rear castors and punched holes to allow for adjustability. The shelves are made of wire, and the display can accommodate a header sign. The display is knock-down so it fits in a relatively small box. Again, this is very basic but very economical. Drawing from our stock line once again, our ninth example is a bit more upscale and a lot more versatile. Shown below is our SW-62FL which is a 2-sided slatwall floor display that comes in a variety of colors and includes aluminum extruded slats and castors. 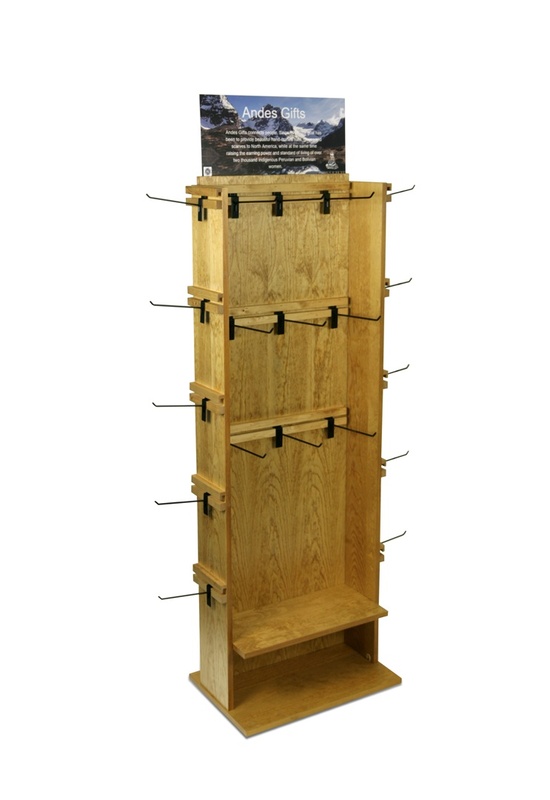 This display is heavy-duty and great for almost any hanging product. 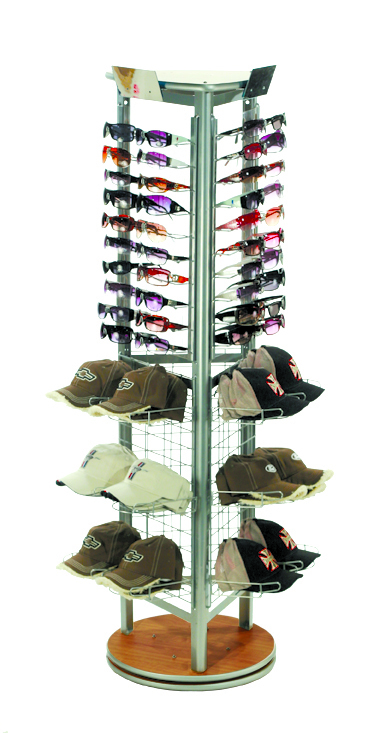 It also can accommodate a variety of other accessories such as shelves, baskets, face-outs, apparel bars, waterfalls, etc. The display can also easily incorporate a header sign. Finally, as we mentioned, floor displays come in all shapes and sizes. 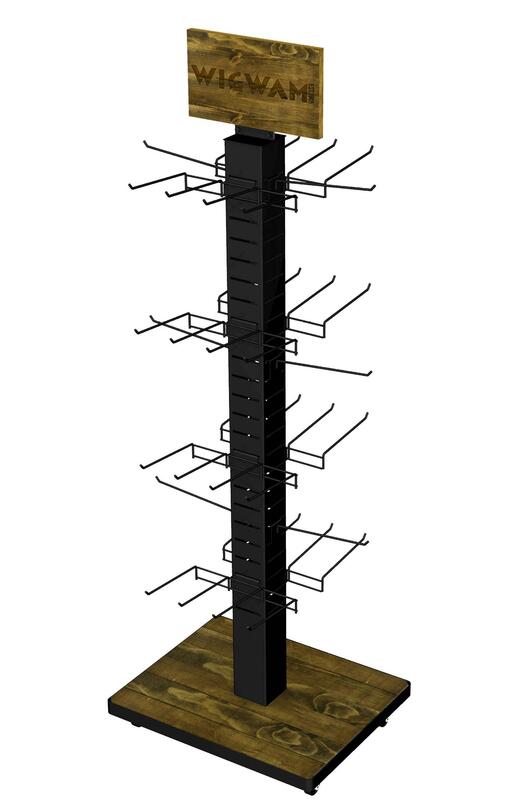 The style shown below is a center-post tower display. This type of display can be used with either hooks or shelves. It is often used with shoe shelves to display footwear. In the example shown below, we have customized our MPP stock display by adding hook attachments for hanging product. It includes a sheet metal base with solid stained wood inserts, a slotted tube center post, and a matching stained wood header with a laser engraved logo to promote our customer Wigwam’s brand. Be sure to look for our next post in which we will wrap up this 3-part series on floor displays with our final 10 examples.